"I have been locked out my Windows 10 laptop as I forgot admin password. Now how can I log into Windows 10 without system reinstallation? It will be good if anyone can tell some way to reset Windows 10 laptop password without losing data." Locked out of your Windows 10 laptop due to forgotten password? Or maybe you are repairing a computer where the user forgot their password. In this tutorial we'll show you how to reset forgotten Windows 10 laptop password with PCUnlocker. Quickly get back into a locked laptop if you forgot your local or Microsoft account password, without any damage to the system. Burn the ISO image file to a blank CD or USB flash drive using the freeware ISO2Disc. If you use a USB flash drive, make sure you choose the GPT partition style because most Windows 10 laptops come with UEFI instead of the legacy BIOS. Insert that freshly burned CD or USB drive into your locked Windows 10 laptop and fire it up. We need to boot from the CD or USB drive. If your laptop ignores the CD / USB drive and boots to Windows 10 login screen, restart and press F2, F11, F12, ESC or DEL to enter the UEFI firmware (BIOS) and change the boot order. Once booted to the CD, you should see the following screen. Select a user account and then click the Reset Password button. The program will remove your forgotten Windows 10 password instantly. 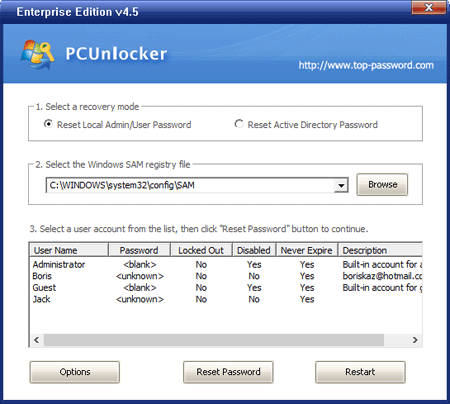 If the local account is linked to a Microsoft account, PCUnlocker will also automatically switch your Microsoft account back to local account. Click on Restart and remove the CD or USB drive. The computer should then boot into Windows 10 and, if everything worked, you shouldn't be prompted for a password. With this method you can reset forgotten Windows 10 password on laptops from the biggest brands including Asus, Toshiba, HP, Samsung, Dell, Sony, Acer and more.